A covered call is an often named and very popular way of professional to boost the returns of their investments while at the same time reducing somehow the volatility of the underlying. Simply stated, a covered call is nothing more than the combination of holding long a stock while at the same time writing a call option on that same underlying. The combination of both being long the stock and short tends to reduce the volatility of the whole position to some extent, although caution should be preserved. A covered call strategy is mostly used when an investor believes a certain underlying, for example a stock, will remain flat or only move upwards or downwards to a limited extend. First, it is important that a call on a share usually represents a multiple, often 1 call represents 100 shares. Hence to effectively apply a covered call strategy, an investor is long 100 shares and short 1 call of the same share. Since the call has a limited lifetime, an additional return is earned gradually when time passed by. This return is received upfront by means of a premium paid by the investor who is long the call. Note, that covered call strategies cap your upside potential during the time the call is in place, while almost all of your full investment is still at stake. A covered call can simply be created by buying x shares in a stock, say 200 and by writing a call on the same amount of stocks divided by the multiplier. Since calls on shares usually have a multiplier of 100, this means writing 2 calls with a certain strike price and a certain time to expiration. A covered call has the benefit to actually reduce the volatility of the whole position. This is because the delta of the call is actually negative. 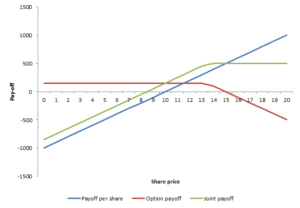 Hence when the share increases by 1 unit, the value of the calls will also increase by the delta of the calls. Since we are short, this means an increase in the share will lead to a loss in the call position. Note that the actual benefit of volatility reduction largely depends on how far the call is in or out-of-the money, and the time till expatriation. Stocks that are deep into the money almost change in value like the share itself. Calls that are far out of the money will have deltas close to 0, hence no value change is noticed when the price of the share changes. A covered call strategy enables an investor the both lower the portfolio’s volatility and increase the overall return. The strategy can be applied by writing a certain amount of calls on underlying positions. However, it should also be taken into account that the overall return is also capped as long as the short call position stands.